ERA Installer Terms and Conditions. The ERA Installer Scheme is open to all security product installers, including Locksmiths, Builders, Electricians, Windows or Door Installers and General Tradesman. your approved MLA number if you are a member of the MLA. Your information will not be used for marketing purposes and we will not contact you about ERA products unless you tick YES in the marketing question on registration. By electing to receive marketing information we can update you from time to time on our new and current products or upcoming events or initiatives. 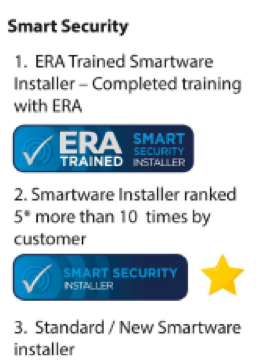 When applying to register as an ERA Security Installer you can choose to register as a traditional installer (locks/hardware), a Smartware installer (alarms, doorbells) or both. You will also be able to select the radius from your postcode in which you wish to be recommended as an installer, and ERA will only include you in searches within that radius. The details shown on ERA’s installer searches are taken directly from your application for registration. If you realise that there is an error or would like to make any changes please email marketing@erahomesecurity.com. We will endeavour to make any requested changes within 5 working days. Once ERA have verified your suitability as a recommended installer, you will receive your installer pack within 10 working days and your details will be available for ERA customer installer searches. When your details appear in an ERA installer search, the searcher has the option to either contact you directly or to ask ERA to pass their details to you. In this case you will receive an email from ERA which will provide you with the homeowner’s contact details. Please try to respond to the home owner within 24 hours as this will be one of the criteria that the homeowner is specifically requested to provide feedback on. Please ensure that ERA is marked as a safe contact in your email system to avoid emails going into your junk folder. You will be given the homeowner’s name , postcode, telephone number and email address. You must only use this information for the purpose of contacting the homeowner to enter into an agreement for the installation an ERA product, or for any other purposes that we expressly inform you of in writing. You must keep the information confidential using appropriate security measures and you must delete the information after you have carried out any services for the homeowner. You must not pass this information on to any third party and at our or the homeowner’s request, you must comply with the homeowner’s rights to be informed about what data you hold regarding him or her, their right of access to that information, their right to have any mistakes in the information corrected, their right to request you to stop processing their information, their right to request you to transfer their data to a third party and their right to be informed about any automated decision making applied to their data. Once your installer details are made available on ERA’s website, you are able to log into your account and provide further information about your business which is viewable by ERA’s customers. ERA reserves the right to amend or delete any information which is or may be misleading or defamatory. an ERA installer beanie hat. If you require larger van decals please contact marketing@erahomesecurity.com. Once you have received 5 ratings of 5 stars or over from customers you will be able to choose an ERA uniform. Membership is on-going and there is no need to renew. If you do not wish to be included in the scheme please contact marketing@erahomesecurity.com and we will remove your details from the Installer Scheme. ERA reserves the right to remove you as a recommended installer at its sole discretion. Homeowners will be encouraged to provide feedback in relation to your services. Please provide them with a copy of one of the freepost feedback forms we supply you with and we will also email customers requesting feedback 2 weeks after their installer search. In the unlikely event that 3 negative feedback reports are received from 3 unrelated individuals ERA will remove your details from the Installer Scheme and you will no longer appear in installer searches. All published negative feedback will be discussed with you directly. Any work you undertake as an ERA installer will be on the terms of the agreement that you negotiate directly with the homeowner. ERA is not a party to such contractual arrangements. As part of the ERA Installer Scheme you are not entitled to sub-contract or pass any homeowner information to a third party. If you are unable to undertake the work requested please let the homeowner know so that they can search for an alternative installer. The ERA Installer Scheme is intended to provide helpful recommendations for home owners to find installers suitable to instal ERA products. 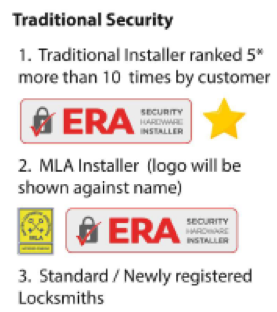 ERA products can be purchased through any main security dealer or directly from www.eraeverywhere.com or by calling 01922 490055. ERA will not liable if, for any reason, the Installer Scheme is not available or is withdrawn. ERA is not liable for any damages arising in contract, tort or otherwise from the use or inability to use the Installer Scheme or from any action or decision taken as a result of using the scheme. For sales enquiries please contact 01922 490055. For product advice please contact the ERA expert team on 01922 490049. For Smartware helpline support please contact ERA on 0345 257 2500.